There are a host of magical wedding venues on offer to visitors at Bride: The Wedding Show at Westpoint Exeter on 7-8 October, and brides will be sure to find the perfect one. Here’s a look at just some of the venues exhibiting. Lupton House is a beautiful exclusive hire manor house tucked away in picturesque and tranquil heritage parkland. The stunning house and grounds have a truly magical feel and our dedicated wedding team will work with you on every detail to give you the fairytale wedding of your dreams. Set in the picturesque Devon countryside on the extensive River Dart County Park estate, Holne Park House has hosted many unforgettable weddings. From the truly unique to the fabulously chic, the venue acts as a blank and beautiful canvas, allowing couples to truly express themselves and put a personal stamp on their special day. The largest 14th Century medieval manor house in the West of England and possibly one of the most romantic venues in the South West. 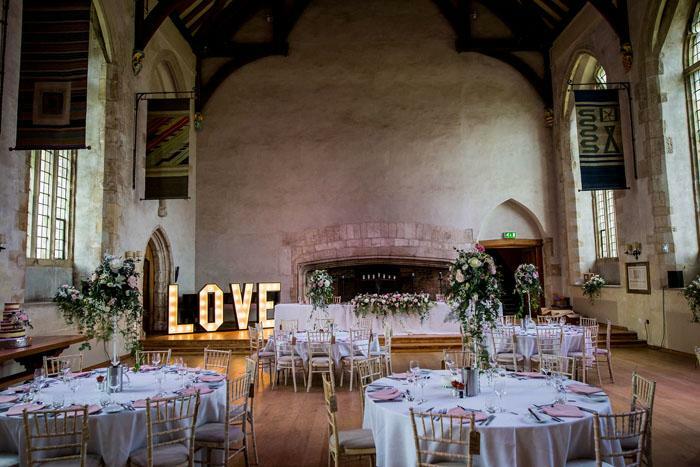 The Great Hall is set in an impressive Grade 1 listed building, with original leaded windows and oak hammer beams, this is a breathtaking venue for your wedding breakfast and can accommodate up to 150 of your guests. The Great Hall can be decorated to reflect your own individual style. Best Western The Dartmouth Hotel, Golf and Spa is a homely hidden gem in South Devon, nestled between two gorgeous golf courses in an area of outstanding natural beauty. A quiet, tranquil and idyllic setting for your wedding day, the stunning location is hard to beat and even harder to leave. If you’re dreaming of a fairytale wedding with an incredible backdrop then our stunning venues will not disappoint. The Eden Hotel Collection is able to cater for the most intimate of weddings right through to those on the grandest scale. Choose from the breath-taking views found at The Mount Somerset Hotel & Spa, the luxurious William and Mary style building of Buckland Tout-Saints, or the magnificent hotel and country estate of Bovey Castle set within Dartmoor National Park. Bodmin Jail offers a unique historic venue for your ceremony and celebrations. The atmospheric spaces and beautiful architecture will give your wedding photographer plenty of creative backdrops to record your magical day. Part of the hotel will be undergoing an imminent rejuvenation project, to be opened in spring 2019. A city centre venue, Mercure Exeter prides itself on providing the complete wedding package for brides and grooms. The team wants them each to have a unique and memorable experience from the moment they step through the door, so are on hand from the moment you say ‘yes’ right through to the last dance – aiming to deliver the very best for every aspect of your perfect day. Just ask the venue’s happy couples and you’ll see why the venue stands out from the rest. Located on the coast of Westward Ho!, North Devon, couples flock from all over the world to get married at Ocean Kave. This is a multi award-winning coastal wedding venue set in 60 acres of private cliff top grounds in a world-class location with outstanding views of the Atlantic Ocean. The venue has been purpose built for weddings, with five-star accommodation and in-house chefs. Tickets are £5 per person or £15 for a group of four adults when booked in advance here; under 16s go free. A booking fee applies. Tickets are £7.50 on the day.